Feature articles for this issue are Quest of the Elusive Shoebill by Robert Sassor, A Root and A Branch by Heather Miles, Melu by Amy Wright, and The Geographic Poems of Travis Macdonald. This edition is also filled to the brim with stunning poetry by John Grey, Robin Chapman, Cory Collins, Kristin Berger, Kristin Berger, Jessica Van de Kemp, Susan Bruce, Milton Bates, Karina Lutz, Julia McCarthy, Timothy McLaughlin, Zachary Hester, Sheila Boneham, Travis Macdonald, Zoë Mason, James Grabill, James Dott, Michael Salcman , and Francis Daulerio. 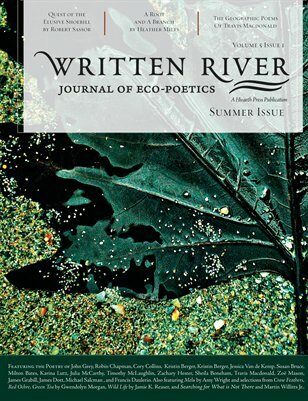 The issue also features selections from Crow Feathers, Red Ochre, Green Tea by Gwendolyn Morgan, Wild Life by Jamie K. Reaser, and Searching for What is Not There and Martin Willitts Jr..